Discussion in 'New Hampshire Race Tracks' started by Race Results, Apr 10, 2019. May 24th & May 25th! Select ticket options have already sold out for Street Outlaws No Prep including Best Seats VIP on Saturday, Trackside Motorhomes and more! Lots of other great ticket options are still available in you act fast! You can be a VIP at the 7th Annual NHRA New England Nationals with our VIP Finish Line Experience! This experience SOLD OUT last year and with a very limited number of tickets remaining this year we expect it to sell out again sooner than later! Not interested in VIP Tickets? That's okay, we still have reserved seats, general admission tickets and camping packages available! The Fan Favorite Event of the Summer! NH Lottery Jet Cars Under The Stars! No show has a larger following than NH Lottery’s Jet Cars Under the Stars presented by O’Reilly Auto Parts and AAA Northern New England. 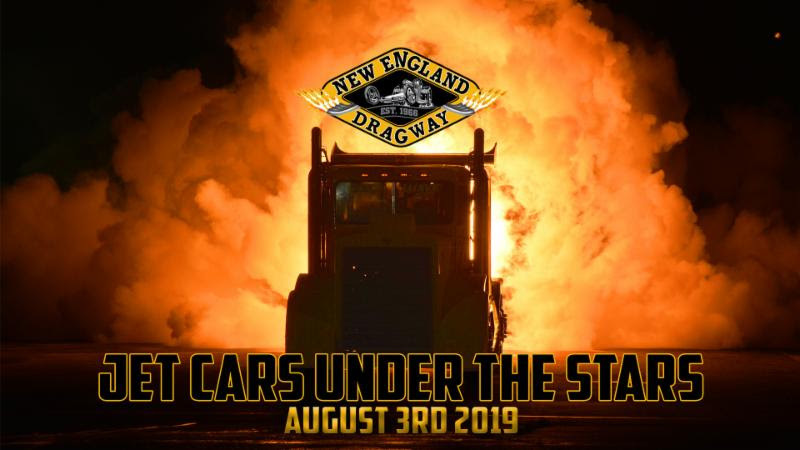 For decades this has been one of the track's most popular family shows with the legends of turbine powered fury assaulting the New England Dragway concrete battleground. Jet Dragsters, Jet Funny Cars and the World’s Fastest Jet Truck, Shockwave! And the World’s Fastest Jet Firetruck, Aftershock will put your adrenaline level over the top. Join us Saturday, August 3rd, 2019, Tickets are available now! We’ll sell you a whole seat but you’ll only need the edge!